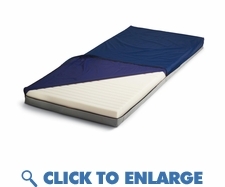 This pressure reduction mattress is designed to fit over any twin sized bed or standard medical bed frame. Designed for hospital beds this outstanding mattress provides both comfort and durability. This hospital mattress provides a great alternative to traditional home care mattresses. Three distinct zones offer excellent pressure reduction and redistribution. Ideal for basic bed sore prevention or can be used as a comfortable base for alternating pressure overlays. The cover is low shear and easy to clean. Can be combined for use with alternating pressure overlays.